For years, I’ve fantasized about penetrating Malaysia’s dense jungle interior on a modern-day Heart of Darkness journey, complete with creeping tigers. This exotic road trip, however, comes with a major perk: after crossing the Singapore/Malaysian border, my chief rest stop will be the urban jungle of intriguing Kuala Lumpur. My excitement builds on the drive to Fraser’s Hill. The drive isn’t long (64 miles), but it feels like a road trip to Avatar’s deep-space Pandora. 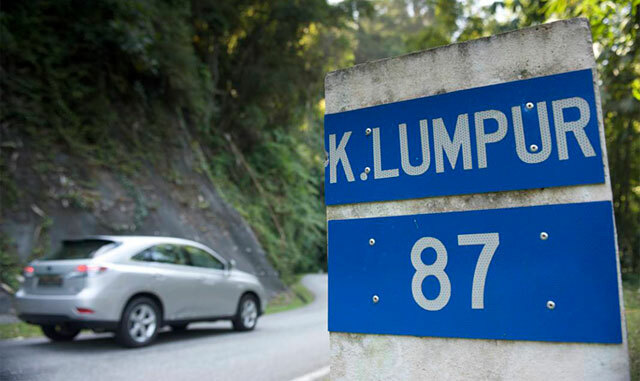 The road gets twisty, and the scenery, which is growing ever more dense, couldn’t offer a more striking contrast to Kuala Lumpur’s glass and neon playground. The farther I drive, the more I feel myself disappearing into the jungle’s 20 shades of green. The stunning range of Malaysia, from ultra-futuristic Kuala Lumpur to the lush Titiwangsa mountain range, is beautifully detailed in this photo essay — definitely worth clicking over and looking through the slideshow. WorldofLuxury: Looks like a job for the LFA! RDS: Woah , that's my country ! But I'm in East , not West .